Do you like to pack notes and surprises in your kids’ lunch boxes? Then I have a treat for you (and your kids!) Valentine’s Day Lunch Box Jokes that wrap around Snack Pack cups. Imagine the joy on your little Valentine’s face when opening their lunch box to discover dessert and a Valentine’s Day joke. That’s how you pack a smile! A few weeks ago my daughter announced, “I want to start packing my own lunches.” Instantly I was filled with a mix of excitement and dread. Of course, I am happy to pass off the nightly lunch box chore. On the other hand, when did my baby get so big?! Whew, my baby isn’t all grown yet. What’s more, she loves my little notes. Of course, that just meant it was time to make a new set of printables for her (and to share!). What’s better than a lunch box note? A lunch box joke! 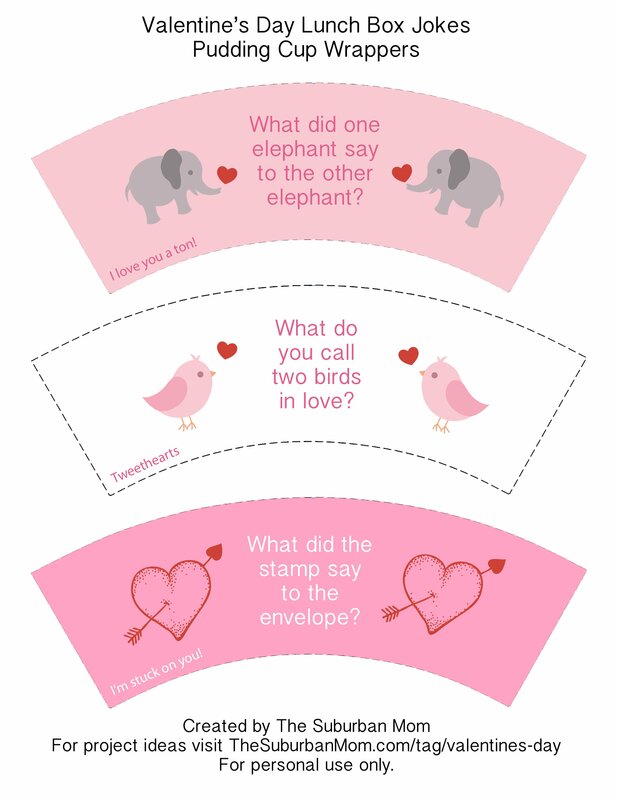 To pack a joke, download the Valentine’s Day Lunch Box Jokes. After you print the jokes, cut them out and wrap them around your Valentine’s favorite Snack Pack for a dessert that sure to make your Valentine giggle. Snack Pack snacks are available in a variety of pudding and jiggly gel flavors that make a fun (and easy) lunchtime snack. Plus the pudding snacks are made with real nonfat milk and fortified with as much calcium as an 8-ounce glass of milk (all puddings except the Bakery Shop Lemon Meringue Pie and Lemon Pudding). Now Snack Packs are even easier for students to enjoy in their lunches because Snack Packs have a new easy open lid. So go ahead print the jokes, wrap them around a Snack Pack and pack a special treat for your Valentine. I love this idea. My kids love snack pack pudding in their lunches too. They grow up so fast don’t they? Way too fast! I wish I could keep them this age forever! How awesome that there is cute lunch box notes that you put on this pudding! We love Snack Pack pudding cups and they taste delicious and are not expensive to buy! I will have to try the notes on the pudding. These are so fun. I love these and thank you for sharing. You’re never too old to have cute notes put in your lunch. I could totally see doing this for my fiance just to give him a smile during the day! She is adorable and I love how she still likes to get a note or surprise from you. I like the idea of the notes or surprises on yogurt or pudding- something you know is good for her and it gets put in yet too cute for her to pass up. Very clever! Yep, they grow up so fast!! That is an adorable idea, my son is 11 I try to slip little things that say I love him into his lunchbox. I just make sure it isn’t something that anybody else will notice. They really do grow up fast. I love it. What a great way to let your little one know how much you love them. Awwww, how sweet that your daughter wants to pack her own lunches but still wants her mother’s love packed in there, too. And no wonder, with the obvious time and care you put into the notes. How nice for both of you! Oh fun! I am going to have to tell those to Carter! He is really getting into jokes now! He will love them! What an adorable way to give your child a little note! That is so cute! My son would love the jokes! First of all, your daughter is beautiful! And secondly, she will always have a lovely memory of you putting notes in with her lunch. My daughter is a mother now and remembered how much she enjoyed the notes I would include in her lunches so is continuing the tradition with her own kids. These are great! My daughter would love them! What a cute idea! I will have to do this with my granddaughter’s lunch on the days she takes lunch to school. Very cute idea. I would probably just put a picture of my daughter’s cat on it. That would really make her day. How cute! my kids love little notes and jokes with their lunch! Aw, this is such a cute idea. My daughter would like this for Valentines Day treats at school. These are adorable! I’ve never seen anything like it before. These are cute. What a great way to let your little one know how much you love them. this is a cute idea… when my children were smaller I would leave them cute notes all the time in their lunchboxes.